The majestic Ahilya Fort towers above the Narmada Ghats. We went shopping on our last morning in Delhi. Delhi offers great shopping possibilities, and our friend Anita – a local and very much in-the know Delhi-ite friend- had given us a list of top local boutiques for the girls to take a look at. The girls had a great time trying on and buying various items, and Gal looked almost like a local, in her very modern but at the same time unmistakably Indian, new clothes. The boys and I understandably were kind of bored by the whole thing, so we went to hang out in a great bookshop. India is apparently the world’s largest English speaking nation today, and a huge amount of titles are published every year. I’m a bit behind on my Indian literature, so I bought the Booker prize-winning The White Tiger, while the kids bought great cartoon books based on Indian legends. 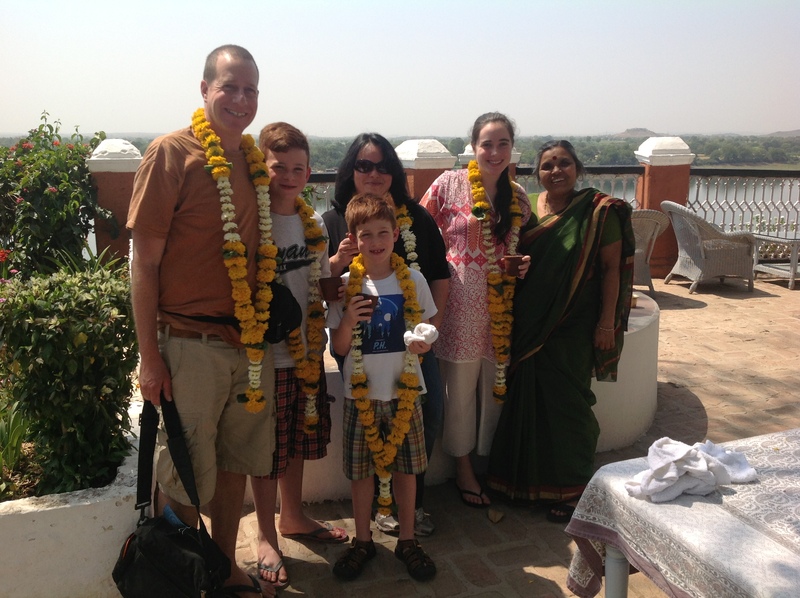 Delhi really is a great city – amazing history and culture, and amazing modern shops and amenities as well. We really enjoyed our stay. Our next stop was again well off the beaten path. We were heading to the vast Central state of Madhya Pradesh, an area that is fascinating in so many ways but doesn’t make it on to most itineraries. Our objective on this trip was to experience the “real’ India as much as possible, and we didn’t need to go to the spots where all the other tourists flocked to. We arrived at Delhi airport well in time for our early afternoon flight to Indore. I had booked online with Jet Airways, who promote themselves as a great modern airline, but our experience was the opposite. The flight was delayed for an excruciating six hours, and the only saving grace was that Delhi’s international airport is outstanding – and if you have to wait around at any airport, Delhi is a good one to do so. We finally arrived in Indore at night, having missed out on our only chance to go sightseeing, and went directly to our hotel, a brand new tower in the center of town. Authentically Indian it wasn’t, but it was great nonetheless. 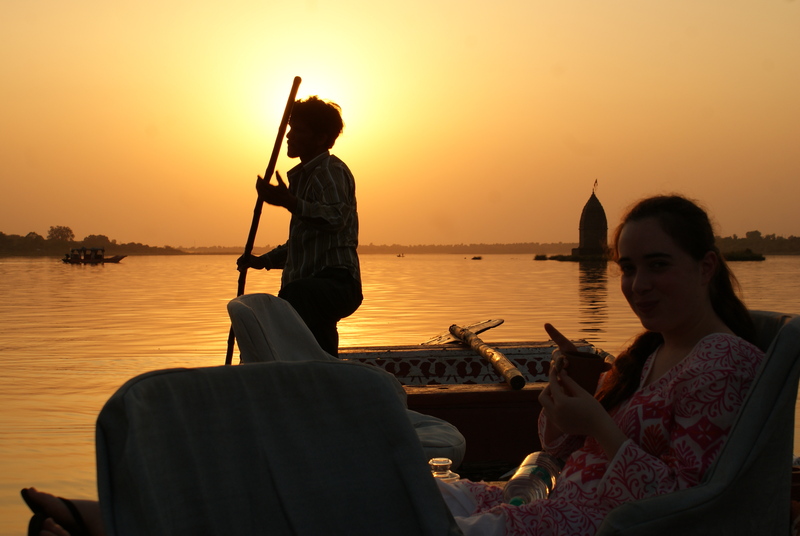 The following day, we met our driver, named Mahesh, for the drive to Maheshwar. Co-incidence? Guide books warn of a long and uncomfortable drive along terrible roads, yet the roads were brand new and in perfect shape – proof again of the incredible rate of development going on in India. The expected 4-5 hour drive was 2 hours at most. 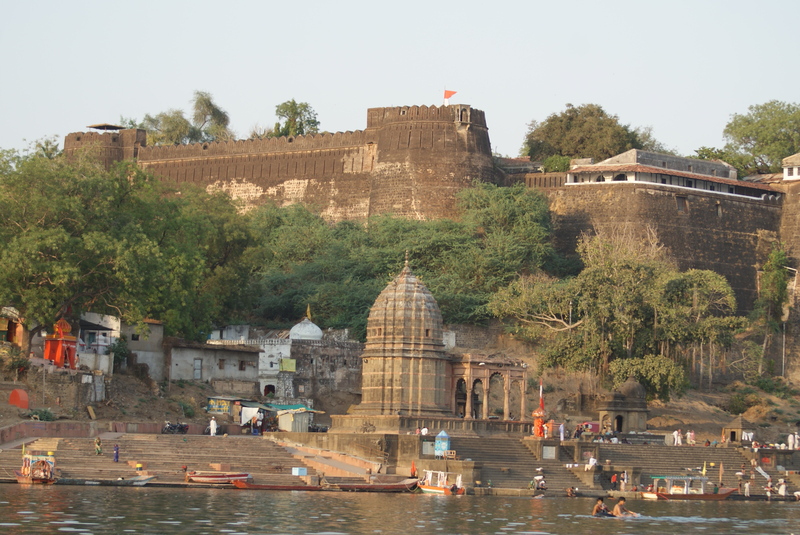 Maheshwar is a small town located along the banks of the holy Narmada River. It is an ancient town, famous for silk weaving and temples. It sees very few tourists, but those who make it to Maheshwar have the opportunity of staying in one of the most amazing hotels we have ever come across – the Ahilya Fort. The Fort is home to the local Royal Family, and while the Prince was out of town (as he very often is), we were welcomed by Kunta Bai, the grand old lady who keeps everything running smoothly, and who was once the nanny to the Prince’s own kids. 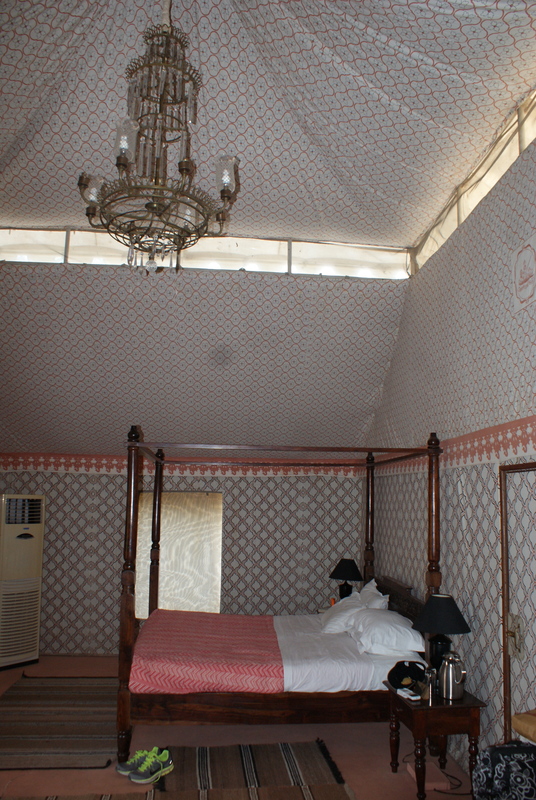 We were given two rooms – the Maharaja tent – a huge tent for Hilit and I, with a king size bed and bathroom suite, and with a private plunge pool, and a standard air-conditioned room for the kids. There are many more luxurious places to stay in India – this fort is lacking in some mod cons – but the whole experience there was simply amazing. The 300 year old fort stands high above the bathing “ghats” alongside the river where locals come both to pray at the many temples, and to cool down after a long hot day. Next door to the fort is a huge temple, and the fort runs its own school, as well as a weaving co-operative. For centuries the local Royal Family has taken care of the population, and while the family lacks political power today, that level of care still remains. We toured the school and met some weavers, and in the early evening we went out for a boat ride along the River – simply magical. Before dinner, Kunta Bai promised Eitan (our 8 year old) that she would make something special for him – just to make sure that he would eat well! That’s the old nanny still coming out! Over the next few days he had home made pasta, chicken raised at the fort itself and more, while we feasted on a variety of incredible Indian dishes. The food was memorable – the fort has its own gardens, and its own chickens, sheep and goats, which it keeps in pens in the vast grounds. I create amazing trips to India. For more info see here. The river is the local swimming pool. It’s free and it’s cool! Local kids enjoying the river. 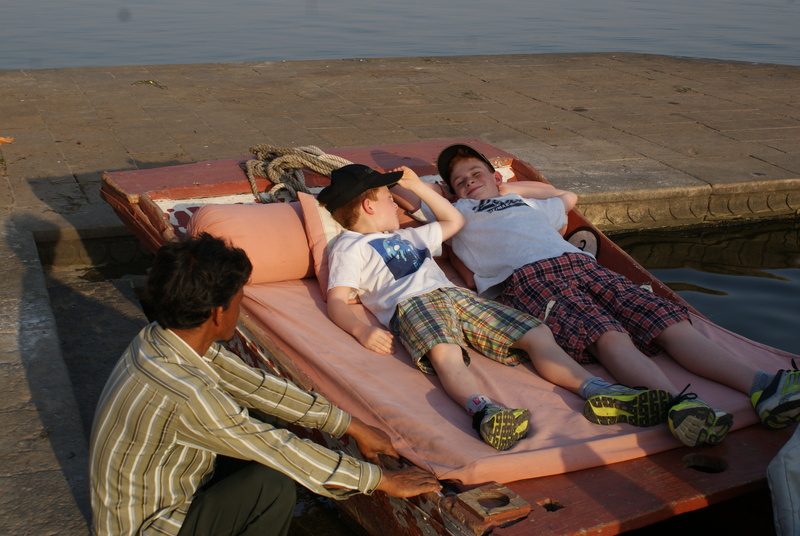 Danielo and Eitan getting comfortable for their boat ride. 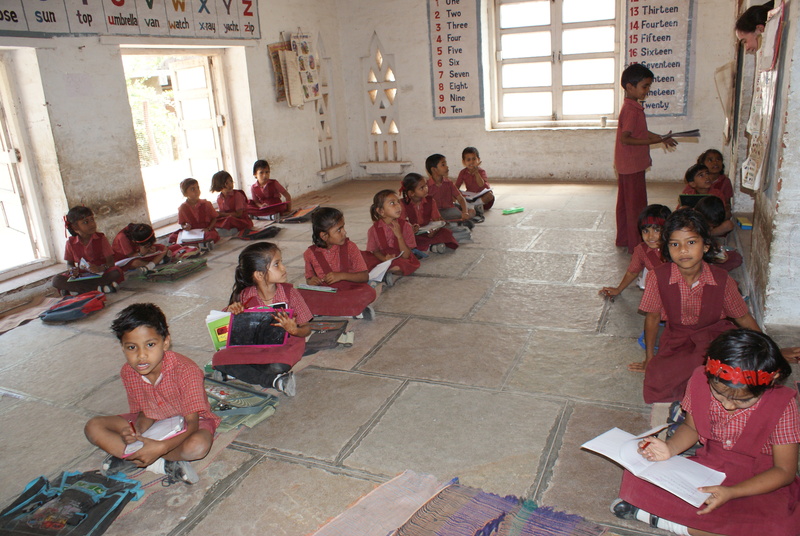 A local classroom – no chairs or tables, but it’s all incredibly clean and neat. « India with Kids 2013: The astounding Taj Mahal! Agra Fort too!